Following the initial announcement, the Ubuntu emulator is going to become a primary Engineering platform for development. While the final emulator is still work in progress, we're continually seeing the improvements in finishing all the pieces to make it a first-class citizen for development, both for the platform itself and for app developers. However, as it stands today, the emulator is already functional, so I've decided to prepare a quickstart guide to highlight the great work the Foundations and Phonedations teams (along with many other contributors) are producing to make it possible. While you should consider this as guide as a preview, you can already use it to start getting familiar with the emulator for testing, platform development and writing apps. Alternatively, if you are running an older stable release such as Ubuntu 12.04, you can install the emulator by manually downloading its packages first. Downloaded images are cached at ~/.cache/ubuntuimages –using the standard XDG_CACHE_DIR location. Instances are stored at ~/.local/share/ubuntu-emulator –using the standard XDG_DATA_DIR location. While an image upgrade feature is in the works, for now you can simply create an instance of a newer image over the previous one. The remote session on the terminal - upon starting the emulator, a terminal will also be launched alongside. Use the phablet username and the same password to log in to an interactive ADB session on the emulator. You can also launch other terminal sessions using other communication protocols –see the link at the end of this guide for more details. The ubuntu-emulator tool - with this CLI tool, you can manage the lifetime and runtime of Ubuntu images. Common subcommands of ubuntu-emulator include create (to create new instances), destroy (to destroy existing instances), run (as we've already seen, to run instances), snapshot (to create and restore snapshots of a given point in time) and more. Use ubuntu-emulator --help to learn about these commands and ubuntu-emulator command --help to learn more about a particular command and its options. Make sure you've got enough space to install the emulator and create new instances, otherwise the operation will fail (or take a long time) without warning. At this time, the emulator takes a while to load for the first time. During that time, you'll see a black screen inside the phone skin. Just wait a bit until it's finished loading and the welcome screen appears. By default the latest built image from the devel-proposed channel is used. This can be changed during creation with the --channel and --revision options. If your host has a network connection, the emulator will use that transparently, even though the network indicator might show otherwise. To talk to the emulator, you can use standard adb. The emulator should appear under the list of the adb devices command. I hope this guide has whetted your appetite to start testing the emulator! 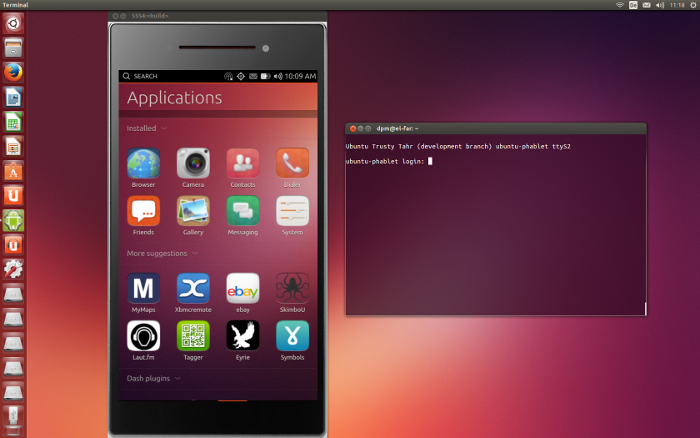 You can also contribute making the emulator a first-class target for Ubuntu development. The easiest way is to install it and give it ago. If something is not working you can then file a bug. If you want to fix a bug yourself or contribute to code, the best thing is to ask the developers about how to get started by subscribing to the Ubuntu phone mailing list. If you want to learn more about the emulator, including how to create instance snapshots and other cool features, head out to the Ubuntu Emulator wiki page. And next... support for the tablet form factor and SDK integration. Can't wait for those features to land!